I know those nights when you really just don’t want to cook. You’re tired, you don’t feel like going to the store, you got home late from work. We all have them. But most of those nights, I also don’t really want to have something greasy and filled with ingredients that are sometimes indecipherable. So instead of just turning to a jar of spaghetti sauce and pasta, I have perfected an easy, delicious, and satisfying stir fry. It also happens to be a perfect meal for a small apartment kitchen. It’s one of the first meals I really tested and modified when I first moved in, and ultimately it gave me confidence to continue cooking on the tiny hotplate. All you need is one pan and a couple of bowls to reserve the ingredients, plus the whole operation takes no more than 30 minutes, including chopping time! Just make sure to have everything cut and ready to throw in the pan – you won’t have time to chop while cooking! You can add any kind of protein, vegetable, or spice, but I have a few favorite combinations. I only use 5 main standbys for flavor and taste – sesame oil, oyster sauce, soy sauce, chicken stock, and ground pepper. Anything else just gets harder to justify for a time and money saving meal. Cut all ingredients and reserve. Heat up 1 tbsp. oil in a small wok (or frying pan). 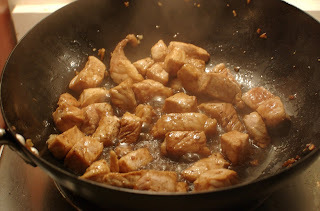 Add the pork and ½ of the garlic and stir continuously for 6 minutes until just cooked through. Add ½ tsp. of soy sauce and pepper to taste. Reserve the meat in a bowl. Heat up the second tbsp. of oil in the pan. Add the peppers, onion, and remaining garlic, stirring frequently, and cook until the vegetables are tender and the onions are almost translucent. Add the rest of the soy sauce, the oyster sauce, the additional pepper and reserve the vegetables in a bowl. 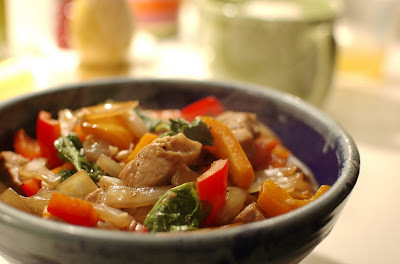 Add the flour to the wok and pour ¼ c. of the stock over it. Whisk the mixture until is it smooth. 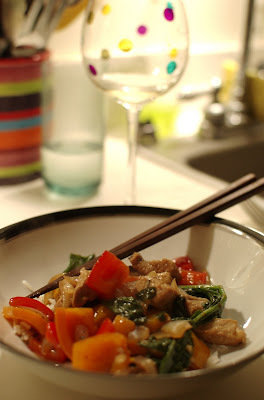 Add the vegetables and pork back to the wok. Add the spinach, pour the remaining ¼ c. of stock over the mixture and stir continuously for another 5 minutes. Season to taste, but be careful not to salt the meal – you’re already doing that with the soy sauce! Serve over rice.